Manchester City FC hosted the Show Racism the Red Card School Competition Awards Ceremony 2014 at the Etihad Stadium on Tuesday 6th May. The club provided the Citizens Suite to be a great venue for winners and guests from all over England to enjoy an afternoon of entertainment and recognition of the inspiring work by young people from the Country’s schools. On arrival all of the guests were able to enjoy the balloon modelling skills of Martin Bennett and take away one of his unique creations. They were also able to view an exhibition of Colin Yates’ football inspired artwork, before taking part in some acetate mask making! There were also refreshments for all and resources and goodies from Nationwide Building Society and SRtRC to take away. The main event got underway with an exhibition of skills from Nike UK Football Freestyle Champion Abbas Farid. Abbas wowed the audience with an array of tricks before co-hosts for the ceremony and patrons of the campaign Charlie Hardwick and Matt Murray were introduced. Manchester City Women players Isobel Christiansen and Emma Lipman were the events special guests of honour, they were involved the presenting of all the prizes during the afternoon. Winners of the competition received a football shirt of their choice, England shirt, certificate and A2 replica of their entry. A full list of winners is available here. Guest presenters joined Emma and Isobel in presenting the prizes to young people of all ages and abilities. Entries ranged from artwork to creative writing to film and music. The films and music were screened and heard and many of the young people were brave enough to read out their creative writing entries, which were all very well received by the audience. A full set of images from the Show Racism the Red Card National Schools Competition Awards Ceremony 2014 can be viewed here. Our thanks to guest presenters who included Fern Whelan from Everton Ladies, patrons of the campaign Gary Bennett, Dave Bennett, Alex Williams and Efe Sodje, Gordon Taylor and Simone Pound of the PFA, Heather Wakefield (UNISON), Collett Cork-Hurst (UNITE), Mandy Beech (Nationwide), Phil Liptrot (Thompsons Solicitors), Paul Bright (FC United of Manchester), Tony Higgins (FIF-Pro) and Councillor Luthfur Rahman (Manchester City Council). At the end of the event, Avis Gilmore, North West Regional Secretary and Simon Jones, National Executive of The National Union of Teachers presented prizes to the Overall Winners. It hadn’t been an easy decision for the judges, but Charlie and Matt announced that the film entitled ‘Our School’ from Heymann Primary School, Nottinghamshire had been chosen as the overall winning entry. 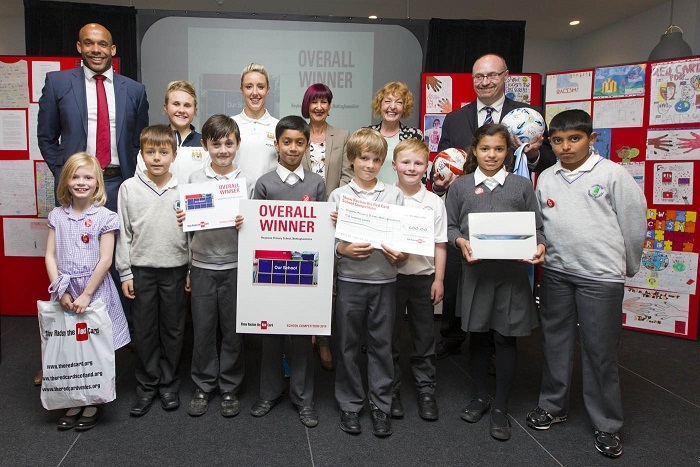 Thanks to the NUT, the overall winners received an i-pad for their school and a cheque for £500, as well as a signed ball and shirt from Manchester City FC. Heymann’s winning film and the other multi-media entries will be available on our YouTube channel from next week. Also at the event Alex Williams, Manchester City FC Community Ambassador and Matt Murray were inducted into the SRtRC Hall of Fame, a fitting recognition for the ongoing support of both of these role-models. Show Racism the Red Card would like to thank Manchester City FC for hosting the event, all of the presenters of prizes, in particular Isobel Christiansen and Emma Lipman, football clubs and sponsors which donated prizes, all of the teachers who ran the SRtRC School Competition 2014 within their schools, and most importantly a big thank you to all of the young people who created entries for this year’s competition.